Asthma is a persistent lung condition which causes narrowing of the airways due to inflammation and constriction. 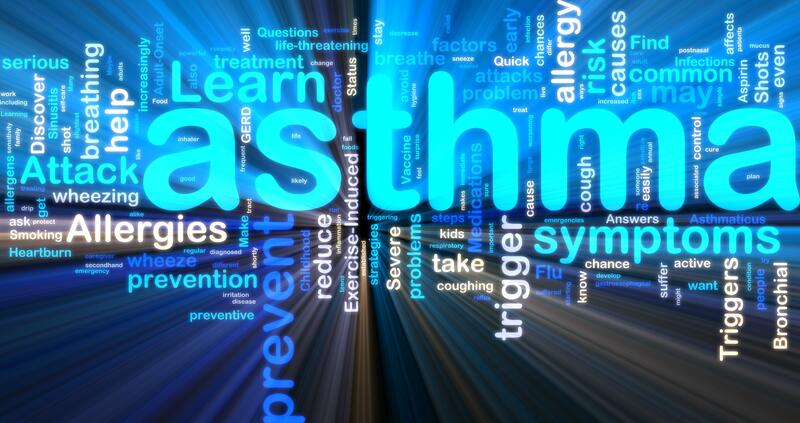 People with asthma often display symptoms such as coughing, chest tightness, wheezing, and shortness of breath. Coughing occurs early in the morning and at night, but may occur throughout the day. When an irritant is inhaled, exposure to cold occurs, or even exercising, the muscles in the airway can constrict and inflammation may worsen. The airways narrow even more when cells produce a mucus which can be very thick and difficult to mobilize. Progressive airway bronchoconstriction, airway inflammation, and mucus production will make asthma symptoms worse and make breathing more difficult. If you have asthma, your symptoms can worsen if you incur a change in your breathing pattern or encounter a substance to which you're sensitive. Asthma is one of the leading causes of missed work and school in America and often runs in families. What tests are performed to diagnose asthma and lungs health? Pulmonary function Tests (PFT) to measure how well the lungs perform assessing the lung volume, strength of diaphragm and the airflow to and from your lungs. How do I prepare for these breathing tests? What treatments are used for Asthma? Commonly, two types of medications are employed to assist with asthma symptoms: long-term medications and rescue or quick-relief medications. Inhalers are frequently used for treating asthma. These medications relieve inflammation and irritation. These inhaled medications are usually a type of steroid. Rescue inhalers are designed to treat the sudden onset of severe asthma symptoms. Additionally, Dr. Avi may suggest IV therapy to help his asthma patients breath better. What is Bronchial Thermoplasty? Is it for me?